Contact a French Sales Engineer for more information about our hydraulic press molding solutions for fuel cell applications. The French ULTRIX series hydraulic presses deliver exceptionally low deflection levels and produce finished-dimension molded parts. These designs provide very balanced load distribution and are developed to produce parts with very uniform material properties (such as critical dielectric constant) while maintaining extremely consistent thickness and flatness specifications. Productivity is improved by reducing or eliminating scrap and costly, time-consuming, post-press finishing operations. In graphite plates, this allows precisely molded flow fields or passages and eliminates costly post machining operations. Productivity is further improved by improving quality that reduces scrap and eliminating raw material waste during post machining. French engineers can custom design an ULTRIX hydraulic press to meet your exact needs. Applications include fuel cell manufacturing, composite parts and precision rubber molding applications. A variety of tonnages and configurations are available. Precision Control Packages are also commonly used in fuel cell applications to improve the accuracy and parameter control. Pressure, speed and position can be greatly improved to levels that are near to serve valve technology. The results are substantial production flexibility, optimization and very consistent part quality. 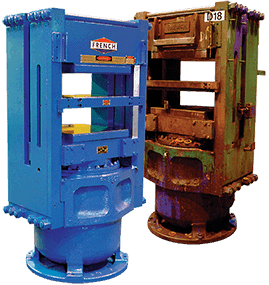 French engineers can custom design a hydraulic press to meet your exact needs. Please contact us for more information.